Samsung's Galaxy Player 4.0 and 5.0 are the Android answer to Apple's iPod Touch, the long-reigning king of portable media players. With specs similar to those of its iOS rival, the Galaxy Player 4.0 makes a gallant attempt to beat the iPod Touch at its own game, but it falls short on battery life and audio quality. The Samsung Galaxy Player 4.0 looks almost identical to the Samsung Vibrant on T-Mobile, save for the front-facing camera, the larger screen and the availability of a white version. 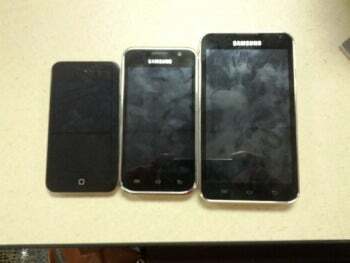 At 2.53 by 4.87 by 0.39 inches, and 4.27 ounces, the Samsung Galaxy Player 4.0 is larger and heavier than the fourth generation 8GB iPod Touch. Its body is constructed primarily of plastic, and it feels cheaply made in comparison to the aluminum-backed iPod Touch. Regrettably, the decorative silver-colored bezel surrounding the screen scratched easily in my pocket. The Galaxy Player 4.0 gets its name from its roomy 4-inch, 800x480 resolution WVGA Super Clear LCD display, which tops the fourth generation iPod Touch's 3.5-inch display in size but not resolution. Standard Android navigation buttons appear beneath the screen. As on most other Samsung handhelds, the power button sits on the right spine of the device, and the volume rocker on the left. The headphone jack rests at the top of the device along with the microUSB port, which hides under a stiff and unnecessary sliding door. In addition to its VGA front-facing camera, the Galaxy Player has a 3.2 megapixel rear-facing camera, which lacks a flash. The white plastic back slides off to reveal a 1200mAh battery and a microSD card slot that you can reach without removing the battery. At its heart, the Galaxy Player operates like any Android phone. To get started, you sign in using your Gmail account (or create one), and all your contacts and other information are synced from the device over a Wi-Fi connection. It runs Android 2.3.5 (Gingerbread), the version prior to 4.0 (Ice Cream Sandwich). We queried Samsung about whether the Player would ever be updated to Ice Cream Sandwich, but at the time of writing, the company had not yet responded. We suspect that the Galaxy Player 4.0 will never leave the realm of Android 2.x. Inside, the Player uses a 1GHz, single-core Hummingbird processor and 512MB of RAM, which together delivered a fairly responsive experience. 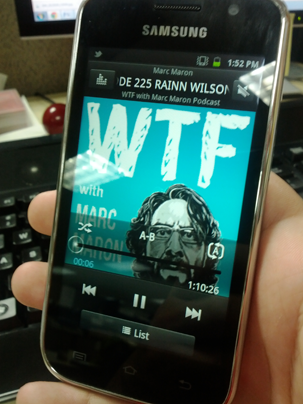 I did notice some minor lag while using the Galaxy Player, however, as I've come to expect from single-core devices. Pages scrolled smoothly enough, but apps would sometimes hang for a second or two before opening. This typically occurred when several apps were open, and a quick trip to the task manager generally solved the problem. Since the Galaxy Player lacks a cellular chip, you won't be able to do anything online unless you're tethered to a Wi-Fi connection. Fortunately, most local apps will run fine without a connection. But a few apps (including Voice Actions) require a data connection and won't run without it. The Galaxy Player 4.0 does come with Google Maps, but it relies on a data connection for GPS. Though you can cache maps for offline use, you can't use the Galaxy Player for turn-by-turn directions, due to its lack of GPS. Samsung rates the Galaxy Player 4.0 for 36 hours of audio playback, or 5 hours of video playback, on a single battery charge. In my hands-on testing, I found that the battery lasted for considerably less time. With Wi-Fi enabled, I squeezed about three hours out of the device while doing things like listening to music and downloading apps. Samsung's devices stand out from other Android-based media players because they qualify as Android-compatible, and thus have access to licensed material from sources such as Android Market and Google Maps. Another differentiator: As on its phones, Samsung has replaced the stock Android interface with a stripped-down version of Samsung's TouchWiz overlay. Anyone who has used a Samsung Android phone will feel at home among the bold icons and finger-friendly buttons. Of the many apps preinstalled on the Galaxy Player 4.0, ThinkFreeOffice seems particularly useful: It lets you manage office documents on the go and can act as a basic file browser, which makes it handy for installing Android apps from sources aside from Android Market. As an Android phone without the phone, the Galaxy Player 4.0 hits the right marks. But a media player that aspires to compete toe-to-toe with Apple's iPod needs ready access to a store where the user can buy new content. Android Market now allows customers to purchase apps, books and music from the same Market application, as well as to rent movies, although TV shows are still nowhere to be found. To download a book or an album from Android Market, you must first install Google Books or Google Music, respectively. Bizarrely, those apps do not come preinstalled on the Galaxy Player. As with other content associated with your Google account, you can run purchased books or music across devices and the media will sync to wherever you are. Android Market also gives you the option to rent movies, which you have 30 days to start and 24 hours to finish once you've begun your film. Apps like Netflix and Crackle are available for those who prefer to stream their content, but Hulu Plus is not yet compatible with the Galaxy Player. If you want to get your own media onto the Galaxy Player, you can do so by dragging whatever files you want onto the Player's 8GB of internal storage, or onto a micro-SDHC card with a capacity of up to 32GB. Alternatively, you can use an application such as DropBox to save files locally to your device. The 720p HD video that I watched on the Galaxy Player's 4-inch screen looked and sounded quite good. The Galaxy Player natively supports the H.263, H.264, MPEG-4 and VP8 file formats. To test audio playback quality, I played my test track, a 320kbps AAC copy of Kanye West's "All of the Lights." Using three different pairs of headphones, I compared the song to the same file playing on a fourth generation iPod Touch. The song sounded a lot cleaner and crisper on the Touch than on the Galaxy Player, which suffered from considerable background static during playback. The hiss was less prominent in the third party app Winamp, so the problem may have involved a software glitch in the native music player on the Galaxy. The Galaxy Player was better the iPod Touch at managing content that was already on the device, and offered greater freedom for moving content onto the device. The Touch still has the upper hand in relation to media selection and ease of use, but the Galaxy Player is better for users who like having greater control over their own files. As an iPod Touch alternative, the Galaxy Player 4.0 has much to like, especially if you're already familiar with Android and have invested money in the ecosystem. The quality of audio played back through the stock Samsung music app is poor, but the Android advantage includes letting you choose third-party player options from Android Market. If you are looking for a taste of Android without having to pay for cellular service, the Galaxy Player 4.0 is a good Android device to tinker with.